This refurbished iRobot Roomba 960 Robot Vacuum is so clever you can program it on-the-go, right from your smartphone. Refurbished to like brand new! These functions work in perfect harmony to efficiently and effectively loosen, lift and pick up mess. If iRobot notices a particularly dirty area (like spills and high-traffic areas), it will ramp up its cleaning to ensure no dirt is left behind. 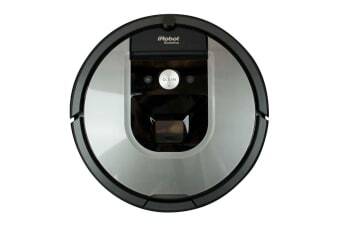 If the iRobot Roomba runs out of charge while cleaning, don’t stress! Thanks to its intelligent design, it will automatically take itself back to the recharge dock before picking up where it left off to finish the job. Clean your home from anywhere! The iRobot HOME App lets you schedule when you want your iRobot Roomba 960 to start cleaning, and will send you a notification when the job is complete! Plus, with the in-app Clean Map™, you can see where your robot has cleaned, areas covered, time taken per job, and more. It’s even compatible with your favourite smart home devices such as Amazon Alexa and Google Assistant – so you can make your entire home a smart one!